These values guide everything we do at Rotunda, including our trainings and internal meetings. This was apparent during a recent team retreat. For three full days in August, the remote Support and Onboarding team members came together in San Francisco to work, learn, and have fun together, all while keeping Rotunda’s values at the center. We know the products we build impact the daily lives of our clients. And those same clients work tirelessly to positively impact their constituents’ lives. Our goal is to stay informed of the unique challenges our users experience so we can identify how Ministry Scheduler Pro, Volunteer Scheduler Pro, and Unison can meet their needs. To do that, we shared and identified specific ways our products and services could best support them. At Rotunda, service is a core value, and it’s also something we support through our software every day. Because of this, it was essential that we spend time serving together. 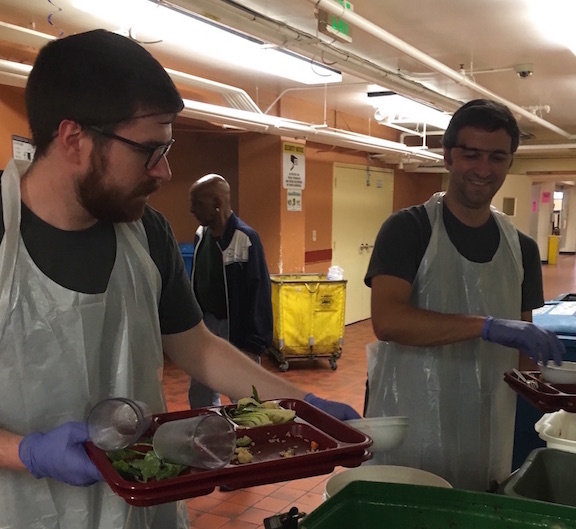 We enjoyed putting on hair nets and gloves to prepare and serve dinner at St. Vincent de Paul, in San Francisco, a shelter that houses and assists over 400 people each day. While we’re all active members of our local communities, we appreciated the opportunity to work side-by-side as a Rotunda team. It allowed us to work together in the same way volunteers who use our products work together each day. We reviewed cases together to share insights and feedback, all with the aim of ensuring our clients receive clear and prompt communication so they can do their jobs effectively. As we worked to find ways to optimize service to our clients, we also enjoyed hanging out together. Since Rotunda is a fully remote team, we normally connect via email, chat, and video calls. The ability to work and laugh together in the same space for a few days gave everyone a chance to connect in new ways and learn new things about each other. The better we know each other, the easier it is to work together and ensure Rotunda clients receive exceptional service.